Some Good News! Even Today. It’s a very confusing day in my world. President Obama is appearing on television and saying some things I’m not very happy about. The National Security State exists to protect and defend the interests of our Corporatocracy and not even the “change you can believe in President” can oppose their interests. My fellow OBRag blogger Frank Gormlie has, I think, addressed many of my feelings in his essay here. On the other hand, there is some good news to report. First of all, Union-Tribune editor Karen Winer is quitting. Or “retiring”. Whatever. She’s been at the helm since 1995 and presided over the most severe decline in readership and circulation in the history of our local daily. Maybe this means that the new owners of the local fishwrap have realized just how out of step the Union-Tribune is with just about everybody in San Diego (except the Copley family’s social network). This is not about the politics of the paper and it’s editorial page, which will most likely continue to hew to the mantras of union hating, militarization and a blind eye towards all the goings on in our fair city that have earned it the label of “Enron by the Sea”. After all, cro-magnon/libertarian/conservative Chris Reed remains firmly in control of its public policy pronouncements. Of course, if the paper hired a really good editor, they’d realize that their editorial pages as presently constituted are a waste of time and money. Why pay big bucks for punditry when there are loads of opinionated wonks and wonkettes on every side of the issues willing to pen their passions for chump change? None-the-less, I’m happy to see any kind of change at the daily paper. 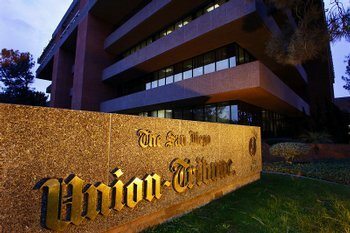 As someone who grew up in the newspaper era, it pains me to see even the Union-Tribune committing suicide in such a public way. The other good news today concerns the attempts by our District Attorney Bonnie Dumanis to prosecute people for purveying pot. A San Diego jury today refused to convict collective manager Jovan Jackson on charges illegally selling marijuana, citing a lack of clarity in the state medical marijuana laws defining collective or cooperative medical marijuana establishments. Yay! If juries can refuse to convict people on these kinds of charges, maybe there is reason to hope for sanity in the legal system. It’s not that I’m pro-drugs. I am anti-stupidity. And the “war on drugs” is just about the stupidest thing going in government at a time when we can’t afford to educate our kids or keep libraries open. My definition of stupidity is broad enough to include many of the things individuals do that destroy their lives. But putting people in jail hasn’t worked. 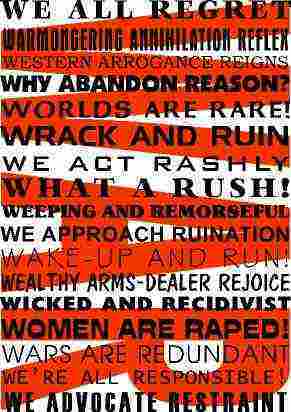 Which brings me to a larger point about “war”: I’ve now come around to the point of view that, anytime a politician calls for a “war” on anything, be it terror or drugs, we’d all be wise to hang on to our wallets and our common sense. Your article was awesome. However, I have seen the numbers on newspaper circulation across the United States. Print newspapers are going to die. No editor or grand idea can save newspapers now. The news is not current, it is a very one way communication, and, placing the biased news stories aside, gets your fingers all black. i agree with shawn – egads – that the newspaper industry overall is doomed. but that being said, signonsandiego.com is a highly visited site. they could be more responsible in the reporting, like the OB Rag…. San Diego Courts find Bonnie Dumanis “unstable”. . . Newer Article: Mayor Sanders Changes his Position on Libraries! Seriously?